Every time you relocate, there are diverse feelings of concern and excitement; excitement over relocating to a new place and concern over the safety and security of all the precious possessions that you have to carry with you. This is where professional moving and storage companies come in. Most of the moving companies nowadays not only offer help with your packing and moving needs but also offer reliable storage solutions. 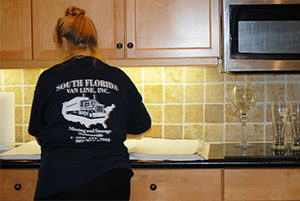 South Florida Van Lines is a moving company that covers all your residential and commercial moving needs. South Florida Van Lines employs experienced, professional and certified moving teams in the Florida area, offering moving and storage services and full-service support assistance for residential and commercial relocation, packing as well as storage. We help out with local, interstate, cross country, long distance, and international moves. Even before your actual relocation starts, our team of experienced delivery personnel and moving consultants will provide you with seamless expertise and planning to ensure the successful relocation of your valuable belongings. South Florida Van Lines is a premier moving and storage company and is your perfect partner for residential relocations. We have a moving team of expert movers who offer high-quality service to make your residential relocation convenient and easy. We tackle local and long distance moves without difficulty and offer customized moving solutions that suit your needs and your budget. At South Florida Van Lines, we use high-quality packing materials to secure your valued possessions and promise to move them safely during your residential move. A corporate relocation can be a quite time-consuming process. Our team has professional experience and knowledge to make your corporate relocation successful. If you are a business owner in Florida looking for a reliable company to take care of your commercial moving needs, South Florida Van Lines is a recommended choice. 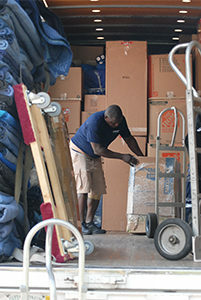 We will take the worry and guesswork out of the moving process, leaving your employees feeling happy and stress-free. If you are planning and executing the move yourself and need help loading and unloading your heavy items, we have the team of movers you need. Having a professional help will make your moving experience go much faster and eliminate hassle. It will also make sure that you can move heavier/fragile items without breaking your back in the process. South Florida Van Lines isn't just one of the best Florida moving companies; we also provide state-of-the-art, reliable storage services to go along with your relocation. Our storage facility is climate controlled with private and personal units for each shipment. We will load your possessions and store them at our secure, climate controlled storage facility for both short-term and long-term periods.